The subtitle for I love and I must, ‘Bell Barr’, which appears in Purcell’s hand in the Gresham Manuscript, has yet to be satisfactorily explained, though there was a small hamlet at the south end of Hatfield Park called Bell-Bar. The title might also relate to the short, chiming motif which recurs throughout Purcell’s setting. In the Gresham Manuscript, copied between 1692 and 1695, Purcell’s songs seem to appear chronologically, and scholars believe that they were mostly copied into the collection soon after they were written: I love and I must may well date from mid-1693. The poet bemoans that if she were rational about her lover, who has another lady suitor, she could solve her problem. Instead she asks why love should appear to be so simple for men, yet so hard for her. 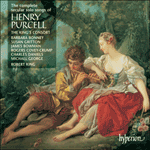 Purcell’s roulade on ‘large’ is especially florid, and his settings of ‘So easy’ (smoothly negotiating a falling interval) and ‘so hard’ (managing only to drop the smallest distance) a marvellous demonstration of his skilful word-setting. A thing that’s call’d man not subject to change. I might at once be inconstant and wise. So easy to men, yet so hard to me.